As the MONTANE Spine Race enters in second night, an epic contest for lead position is being played out across the Pennines. Jasmin Paris (GBR), first placed female, is running neck and neck with 2013 MONTANE® Spine® Race winner, Eugeni Roselló Solé (ESP), first placed male. This battle of the sexes commenced from the start of the race when both Paris and Roselló Solé along with Eoin Keith (IRL) established a commanding lead. They continued to run together until they reached CP2 at Hardraw, 108 miles into the race. However, Paris and Roselló Solé took advantage of Keith’s decision to sleep for an hour and continued on, eventually building up a 10 mile lead. At 8 PM GMT both lead runners maintain a considerable lead over Keith. But having relentlessly covered a distance of 142 miles in 36 hours and more than 125 miles to go, and with Keith and John Knapp (GBR) not far behind, anything can happen. In the women’s race, Shelli Gordon (GBR) maintains a considerable lead over Gabriele Kenkenburg (DE) for second place. Both the MONTANE® Spine® Challenger and the MONTANE® Spine® Mountain Rescue Team (MRT) Challenge, which is on the same course as the MONTANE® Spine® Challenger but only open to active Mountain Rescue personnel from England, Wales and the Scottish Borders, completed today. 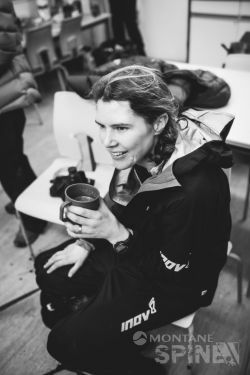 Jane Hilton (GBR) completed the MONTANE® Spine® Mountain Rescue Team (MRT) Challenge, with a time of 51h 31m 36s. The weather has been milder today with temperatures around 5°C and 10 mph wind gusting to 25 mph.